Why am I having nose bleeds? The nose has a rich blood supply which enhances it’s role in heating cold air as it passes through the nasal airways. In some cases the small blood vessels called arterioles become prominent and dilated near the surface of the nose lining, becoming prone to bleeding, especially if they become infected. This will normally present with recurrent nose bleeds or small spotting of blood when you blow your nose. The majority (90%) of bleeds occur in Little’s area, which is at the very front inside part of your nasal septum (wall dividing the nose). These bleeds usually resolve with mild pressure being applied on the outside of the nostrils for 15 min. 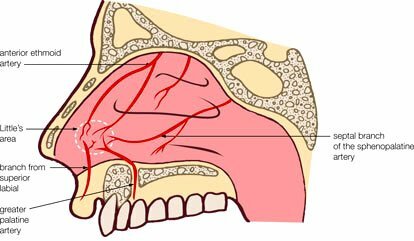 In 10 % of cases bleed occur high up in the back of the nasal cavity and they bleed heavily and the person will usually cough up clots of blood as a result. This is a medical emergency and in this case the person needs to go to the emergency department and not present to the Medical Centre. The Procedure is quite quick and not invasive as only the lining of the nose is being treated with a small silver nitrate tip smaller than a cotton cue tip. The silver nitrate that comes in contact with the lining of the nose causes a localised chemical reaction that seals the blood vessel. This is done under a local topical anesthetic so there is no pain during the procedure. In some cases we might have to treat an infection on the nose lining with a topical antibiotic cream for 10 days before sealing off the leaking blood vessel.